Stephen King, according to my copy of this book, calls it "a masterwork of narrative suspense". I can only surmise he has found it hanging somewhere in a really nifty way. It is one of the more underwhelming books I have read this year. 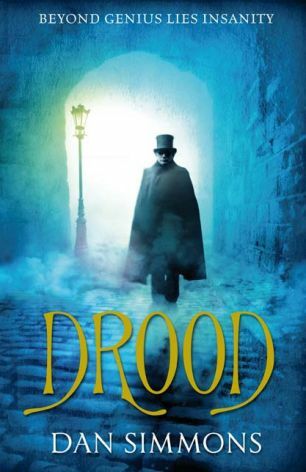 First you should know that The Mystery of Edwin Drood was Charles Dickens' last novel. It was left only half finished at his death, and no one knows how it was supposed to end. Simmons is not the first to find inspiration in this state of events. He is not even the first to write his own mystery story with Dickens' novel figuring somewhere at the centre. But he is the first that I know of to make his mystery so completely over the top. What Simmons has done, basically, is say "I can do nothing interesting with the actual mystery of how Edwin Drood would have ended, but I want to profit off whatever connotations of mystery it still carries, so I will mix it up with magic evil Egypt and suggest Dickens may have been a murderer, oh and Collins too and possibly make them both victims, oh and because opium seems to be central to Dickens' book, and since it was central to Collins' most famous book, I must mention the drug three times on each page". The narrator is Wilkie Collins. It has little to nothing to do with the author Wilkie Collins. Simmons makes use of parts of his life, and his name, and his work; but any confusion with the actual Collins (even though he may not have been lily white) is barely short of libel (or is it slander?). That is not my main problem with the narrator, however. My main problem is the lack of subtlety. It was apparent in the very first chapter that Simmons was attempting an unreliable narrator. And that is ok. I like unreliable narrators. Ideally it should be less blatantly obvious, but sometimes the giant big sign which says "I am a scoundrel" can be nice, too. But Simmons does not trust his readers. He seems worried that if he has Collins' envious character describe Dickens as a bad author, inferior to himself, the reader might believe him. So Collins is left constantly contradicting himself. It gets annoying. It is about as subtle as a sledgehammer (I'm sorry about the cliché, but the book does not inspire creativity in me). My problem with this is that that explanation of Dickens as racist, yet liberal, only makes sense if the narrator knows that in our time that would not be considered the views of a liberal, or in any way acceptable. Yet somehow Simmons' Wilkie Collins is placed outside the "majority of Englishmen" and able to see the incongruity in the position. If I seem annoyed, that is not only because Simmons has written a thoroughly sub-optimal book. He is not Dan Brown. Somehow that makes it worse. What I am trying to convey, oh so inarticulately, is that Simmons could have written something truly engaging and interesting. The book is very well researched. He seems to have read books you usually have to dig for in most major libraries, if they are there at all. He knows his Dickens, his Collins, their lives, what they wrote. Probably what they ate. And then he fails to follow through. In part because he is too anxious to make use of all this research. I am greatly honoured to have such a famous writer visit me. I so greatly enjoyed your The Woman in White that was serialised in All the Year Round immediately after Dickens' A Tale of Two Cities ended. (46)? But most of the book does not shine. Which brings me back to Stephen King's comment on narrative suspense. The book seems to be written as a sort of semi-homage to the sensation novel (a choice probably connected to the use of Collins as narrator). It lives on uncertainty and gory detail. Shock and horror intersped with long, long periods of nothing. These periods are attempts at creating suspense. He cross-cuts, creates cliffhangers, leaves unresolved mysteries … unresolved, while the narrator trudges around Victorian London looking at the fog and avoiding footpads. If done right, it would create suspense. At the moment it is just annoying. If these interlude periods were well-written, that would help. But there is a limit to how much half-hearted mediocrity and grumblings about Collins' complicated personal life or Dickens' philanthropy a girl can take before it just gets annoying. Annoyance is not conductive to suspense. That said. I liked the uncertainty about the mental state of the narrator through most of it (although I think it undermined itself at one point). And the twist did tie up and justify some of the things that had annoyed me early on (hence their absence in this review), but it was too little too late. And it was followed by more unnecessary mediocrity, so I hereby revoke any bonus points it might have gained by that.